It's pretty late in the 2015/16 hockey release calendar. Traditionally, this is the part of the year where the high-end products start releasing. When I heard about Portfolio, I totally thought that this would be a one-pack-per-box product similar to Panini's Playbook brand. This is actually nothing like that. I came into this product without any research, so finding out that it is a lower-mid end product was a surprise! The Portfolio base cards look a little bit like the old Upper Deck Masterpieces cards released in 2008 with their brownish borders. Unlike those cards, however, this border is just printed onto the card so it doesn't really stand out. Since these borders look like a frame, the flat look kind of falls flat. The overall feel of the card is more on the low-end side of things. Fortunately, the photos on these cards make up for any design deficiencies. 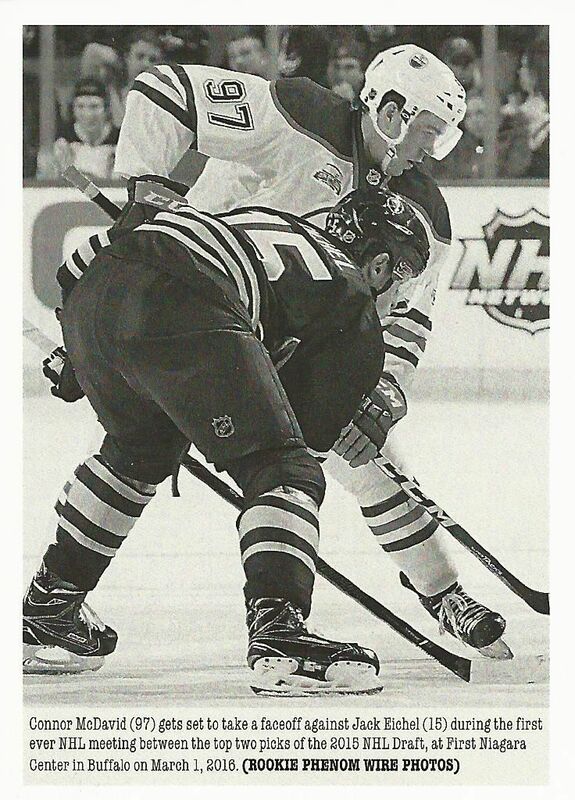 The pictures that Upper Deck used in this set rival even their Series One and Two offerings. There's tremendous action captured as well as unique moments and expressions on the players faces. The photos look great. I just wish the border did more to make the cards attractive rather than take away. The back of the base cards have a no frills look, and I am just not a fan of the brown color used on the bright white background. Brown is an odd choice for a hockey product, and you can see here why it isn't really used often. Upper Deck may have been going for a bronze-frame color... that's the only defense I can give it... but because the printing isn't metallic enough, it just doesn't work. 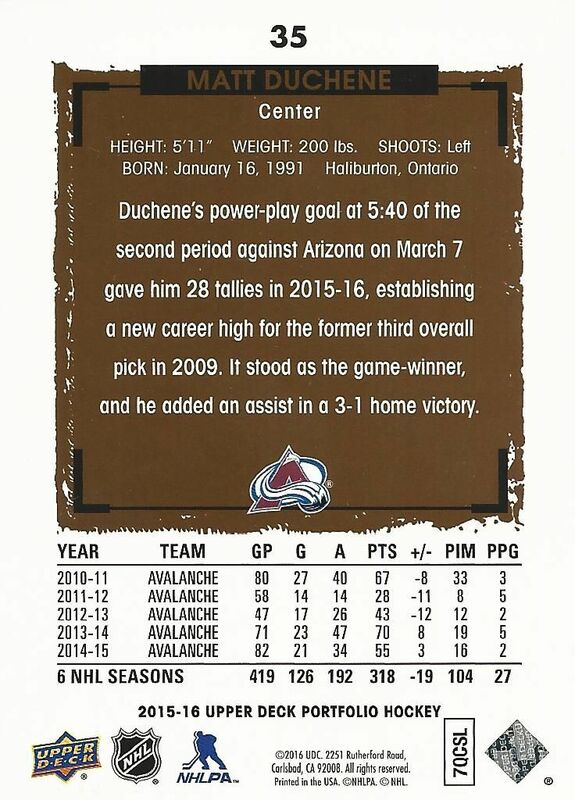 On a positive note, I like the nice written information about the player that is provided on the back. It's always nice to have something more than just the standard statistics given. 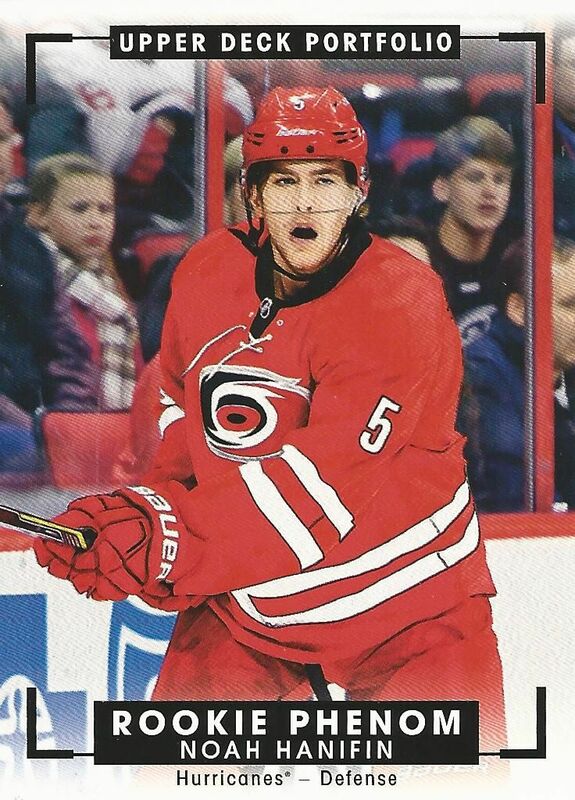 The standard rookie card in the set looks exactly like the base card except for a 'Rookie Phenom' logo above the player's name and a red colored border instead of the brown one. And the red border makes a HUGE difference in the look of the card. Though the overall design is still a little lacking, I think the red border looks leaps and bounds better than the brown one. The back of the rookie cards thankfully replace the brown with red as well, the the backs also have a nicer look too. Usually, the base set would end with just the standard cards and a rookie sub-set, but in Portfolio there are some unique additions after those cards. Wire-Photo cards make a return again this year. I have always been a fan of the Wire-Photo cards as they bring things back to an older era of photography. Usually these photos are black and white and have a bit of grain to them. 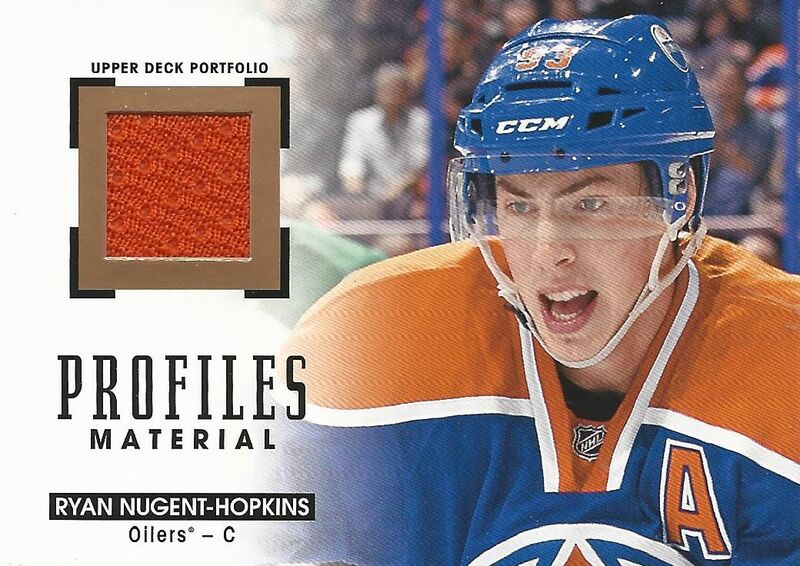 There are Wire-Photo cards in this set like that featuring older players, but the newer players like Connor McDavid have Wire-Photo cards that look a bit too modern and sharp. So the feel of the card is taken away a little bit. Also, these cards have a really bright white border. And that's a modern look too. It would have been nice to have these cards retain more of a cream or off-white style in my opinion. At first glance, I thought these Color Art cards were parallel cards, but they are in fact a continuation of the cards of the main set. These cards lose the side borders and replace the top and bottom borders with a fade-to-white effect. These are decent looking cards, but the white portion of the cards remind me of lower-end cards like Fleer or Ultra. I think having them be full-bleed (like UD Series 1 and 2) would make for a better look. Both veterans and rookies have Color Art cards in the set. Black and White Art cards are also a part of the main checklist, however, I didn't notice any of those cards in my personal box of Portfolio. Upper States that each box of Portfolio will have one autograph and one memorabilia card. That's not too shabby for a product of this type. If you do buy by the pack, you'll have to try and fish the hits out of the twenty that are contained per box. My box was nice in that it over-delivered on hits. I was able to pull an autograph and two jersey cards. Single jersey cards aren't too exciting for collectors anymore as they usually don't hold much value. They are fun pulls, but you can usually find almost any player for just a few dollars. Though the dollar value may not be there, at least these cards look very nice. The Profiles Material cards are classy - I would consider these cards a definite step-up in design from many of the standard single jersey cards you find in other products. Upper deck has put a medium-small piece of jersey into these cards, but really dressed it up with the rest of the card elements. Cards with multiple jersey pieces are harder pulls and expand upon the design of the single jersey card. 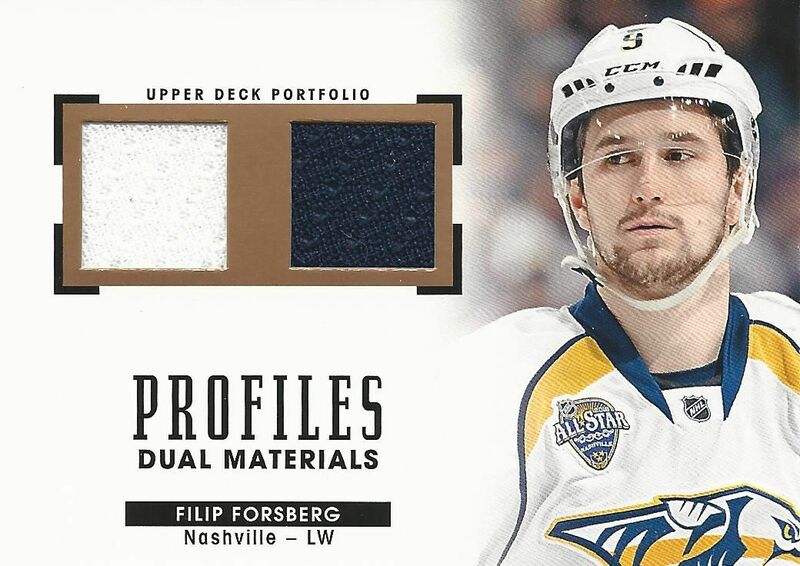 The Dual Materials card of Filip Forsberg card looks very nice though the space for the photo has been decreased by a good margin. 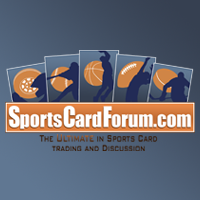 Quad piece and six piece jersey cards can also be found in Portfolio. Silver and Gold variations of the Materials memorabilia set contain nicer piece of material such as patches and straps. 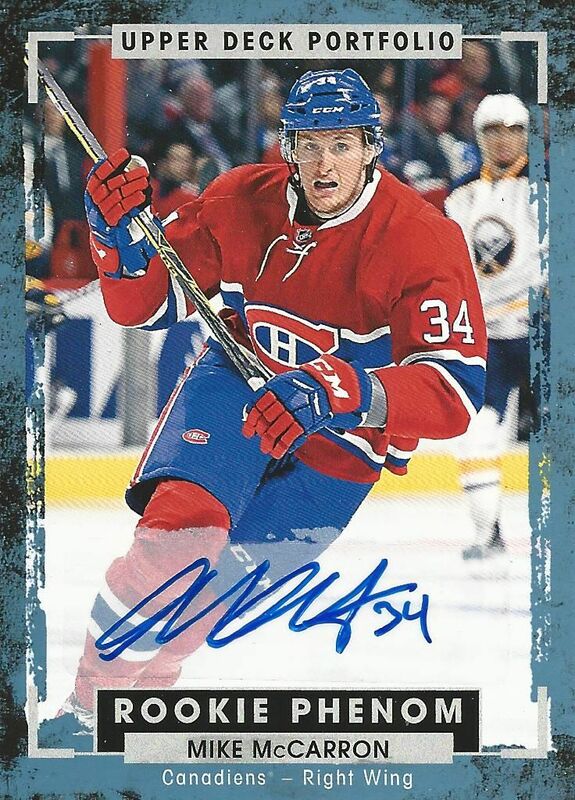 The autographed card I pulled was of Mike McCarron. It's a rookie autographed card with a blue border. The autograph is blue ink and on a sticker. Overall the color and look is nice. The blue border is also much better than the brown of the regular base set. Autographs can come on rookie cards such as these or on any of the other subset cards such as Wire Photos and Color Art cards. Upper Deck has tiered the autographs to make some players easier to get while other are much, much harder. I've covered the main memorabilia and autograph cards in Portfolio, but there are more to find. Hidden in the set are redemption cards as well. Lucky collectors who find them can redeem them for future rookies. The box also states that updated SP Game Used cards have been inserted as well. 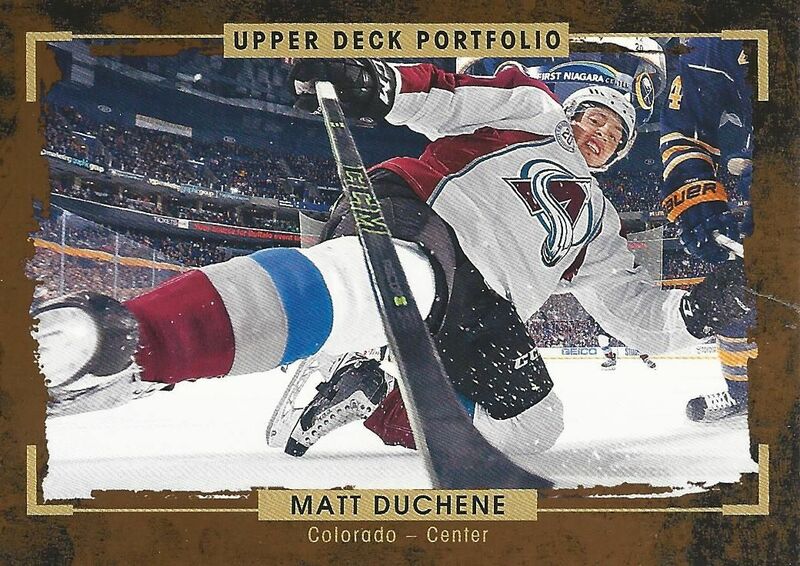 Upper Deck Portfolio is a surprising product to me. I'm surprised that an affordable product has been released this late in the hockey card release calendar. This product is a fun buy especially if you appreciate photography. The shots that are portrayed on the fronts of these cards are really fun and spectacular. I could look at these cards over and over and enjoy the moments captured on them. 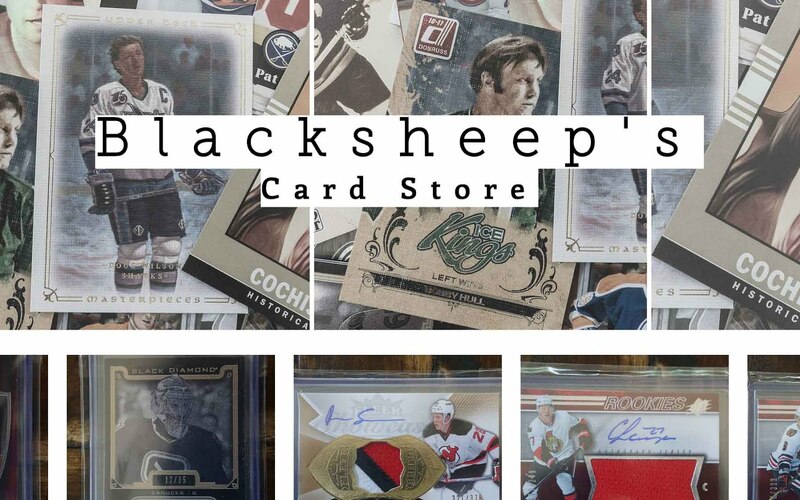 Purchasing a box, collectors can find a modest amount of hits to enjoy. It's nice that Upper Deck pretty much guarantees an auto and a memorabilia card per box. It's a relatively affordable product that may even be fun to get by the pack. Will this be a must-buy product that everyone has to get their hands on? Probably not... but it really is a product that everyone can choose to purchase at their budget level - and that's what I appreciate about Portfolio. 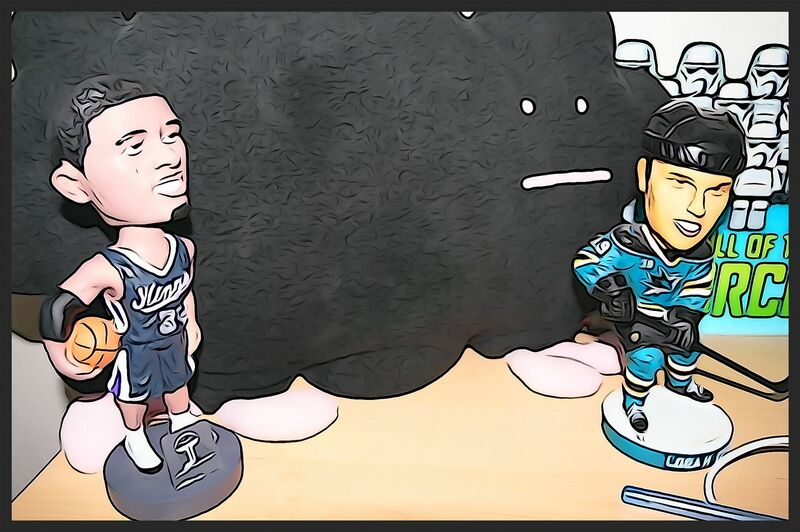 I'm happy that Upper Deck has released a product that everyone can enjoy. Your review was great can't wait to buy it for myself great job! Love the design on the jersey cards! Nice break! I think you got lucky with the extra jersey. I think the inserts are awesome and I think the jersey cards are clean like you said. Great review, I'm really not a big fan of the base cards but the wire cards were the best in my opinion and the look of the insert cards looked clean, which is also what I liked. I usually don't pick up recently released hockey boxes but I might have to pick up one of these! Awesome review as always, wish you had gotten some really crazy hit though. Cool new product by upper deck. I'm not a huge fan of the base card design but I do really like the look of the memorabilia cards. Great review as always! I am not a fan of this brand. I think the base cards they coukd have done more however I do like the rookie phenom cards. One nice thing is you sure get alot of inserts and rookies per box which is nice. 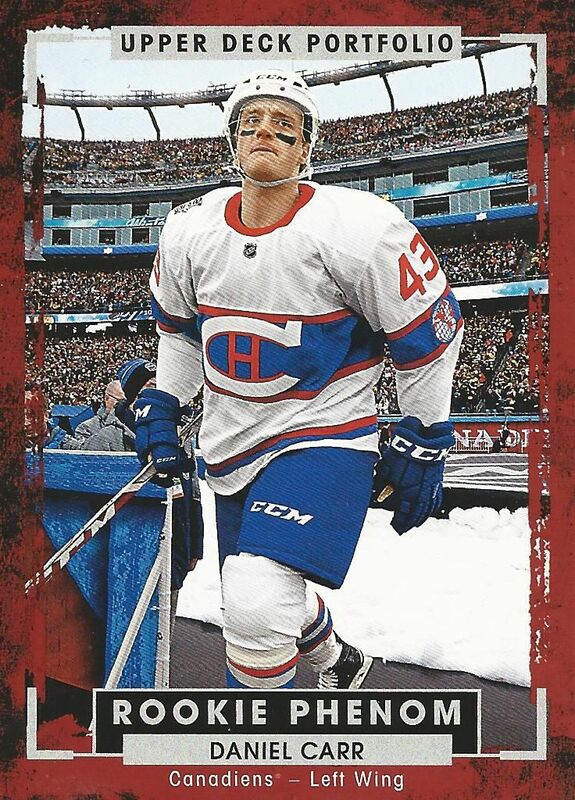 Nice McCarron auto being a Habs fan! Not sure about the price tag and what you get though. Might grab a few packs when I'll visit my LCS. A pretty cool product! I love sets like this that aren't like the regular upper deck series. Good box too! Great review as always! Interesting product for sure and nice hit. Thanks for the review might have to try the product. I'm personally not a fan of the base design, but the design of the hits are pretty good. Not a fan of the base cards but great cards! Keep up the good work! Clean product! I love the Profiles cards! That was great! Totally something I would buy! Decent product thanks for the review! love the reviews! keep it up!!!!! These look great! Wonder if they will make it to epack? Really love this product reminds me of Masterpeices! Overall I think this product is great. Great video! And i like this product! I like alot of the designs of the cards, and overall enjoy this product alot! Nice box break review and the card look nice. Overall its a great product because theres tons of sweet pulls you can get out of this. There's a few cards I would like to buy off your site .